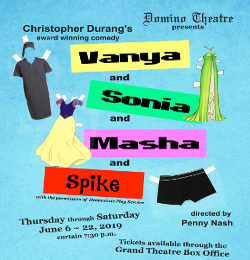 Thurs.-Sat., June 6-22, 7:30 p.m. Since its unusual beginning between feature films at the old Odeon Theatre, Domino has grown to a full seven-play winter season. Each season offers an appealing mix of drama, comedy and mystery from the Canadian and world stages. Domino is truly a "community" theatre. People from all walks of life pool their skills to present productions of a consistently high calibre. 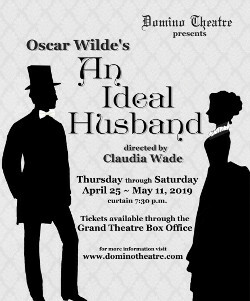 As a member of the Eastern Ontario Drama League and Theatre Ontario, Domino is actively involved in the Ontario amateur theatre community and has acted as host to several annual festivals. 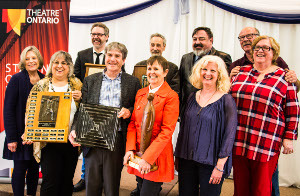 Many Domino people and productions have been recognized for their excellence at the regional and provincial levels. With a Board of Directors elected by the membership, and with advertised auditions open to all, Domino welcomes the participation of interested volunteers both on stage and behind the scenes. Domino Theatre displays original artwork by local artists in the theatre lounge throughout our regular season. For more information and to apply click here. Due to renovations, we will no longer be accepting costume donations until further notice. Order the book on Domino's first 50 years here. Tax receipts will be issued on request.